Our beautiful SAGA arctic marble fox fur blanket stands out in your living room or bedroom. 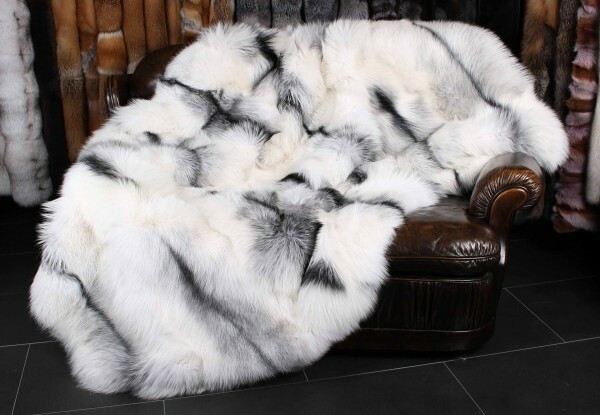 With its black and white natural tone and the soft real fur is a must for the cold season. Real fur is renowned for its breathability and naturally regulates your temperature throughout the night so you can keep comfortable. The arctic marble fox skins come from Scandinavia, and we always purchase them directly from the SAGA furs fur auction in Helsinki, Finland. Scandinavian foxes are known for their dense and silky coat. We guarantee you to use only the highest quality foxes for our fur blankets in our workshop in Kiel. Ссылки на другие веб-сайты "SAGA Arctic Marble Fox Fur Blanket"
Оценки покупателей по "SAGA Arctic Marble Fox Fur Blanket"